After watching Jaguars and Ferraris racing and winning on American tracks, designer Harley J. Earl envisioned an American sports car that could compete with them. Not long after convincing GM executives that they needed to build an inexpensive sports car, the "Corvette Dream Car" debuted at the New York City Motorama in January of 1953. The two-seat roadster was an immediate hit. One of the thousands of people who viewed the Corvette concept car at the Motorama was a Russian-born engineer named Zora Arkus-Duntov. It inspired him enough to write a letter to Ed Cole, then chief engineer of the Chevrolet Division, sharing his desire to work on the car. He was hired by GM later that year. The first Corvette went into production June 30, 1953, a short six months after the Motorama show. Built by hand in GM's Flint, Michigan facility, dozens of minor changes were made during the first-year production run. The convertible-only body was kept very close to the concept car; rounded front fenders, vertical-toothed grille with 13 chrome bars, recessed headlights with mesh covers, and jet-pod taillights capping off the rear. To get the car into production quickly, fiberglass body panels were chosen over conventional sheet metal. This eliminated the time-consuming and expensive tooling process required for steel panels, and made the car much lighter. Chevrolet signed a four-million dollar contract with Molded Fiberglass Products Company of Ashtabula, Ohio to manufacture the 46 separate fiberglass parts that together would make up the body of car. The fiberglass body was set onto a conventional X-member box girder frame with a wheelbase of 102 inches, exactly that of the Jaguar XK-120. Overall length was 167 inches. Front suspension consisted of coil springs with tubular shock absorbers and a stabilizer bar. Rear suspension used leaf springs, tube shocks and a solid rear axle. All 1953 Corvettes were painted Polo White and had red interior. There were no outside door handles; the driver reached inside to gain entry. Convertible tops (all were black) folded manually into a storage space behind the seats and hid under a hinged panel. The interior featured two bucket seats and a floor-mounted shifter for the two-speed automatic transmission. Gauges spread across the dashboard with a 5,000 rpm tachometer center-mounted. As early Corvettes were built on a budget, many existing off-the-shelf parts were used. Steering, suspension, and brake components were borrowed from Chevy passenger cars and trucks, as was the inline six-cylinder engine and Powerglide automatic transmission. Although cool looking with its triple side-draft carburetors, the Corvette's "Blue Flame Six" was considered underpowered for a sports car. Displacement was 235ci, with a bore and stroke of 3.56" x 3.93". Compression was 8.0:1. The motor was solid and reliable, but peak horsepower was just 150 at 4,200 rpm. 1953 proved to be a great sales year for Chevrolet, outselling their top rival Ford by 100,000 vehicles. Corvettes accounted for 300 of these. 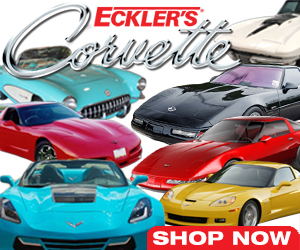 A Corvette buyer now had a choice of exterior color; Pennant Blue, Sportsman Red, Black, or Polo White. A beige interior came with a Pennant Blue Corvette, while all others had red interior. Convertible tops for 1954 were tan instead of black. Clip-in side curtains, which were stored in the trunk when not in use, made their second and final appearance on Corvettes this year. Corvette production moved to St. Louis, Missouri in 1954, where it would stay for another 27 years. The newly renovated assembly plant was able to turn out 50 Corvettes a day. After about 500 Corvettes were assembled, the two hood releases were changed to a single release. The stainless-steel exhaust tips were lengthened to eliminate staining the body paint. A mid-year camshaft modification in 1953 raised the output of the Blue Flame Six by five horsepower, to 155. The Powerglide automatic transmission remained the only transmission available. Base price was lowered from $3,498 to $2,774. A total of 3,640 Corvettes were produced in 1954. Chevrolet saw a reversal of fortune in 1954; they were outsold by Ford by 22,381 units. Much of this was attributable to Ford's new OHV V8 engine. GM was seriously considering shelving the Corvette, but fate intervened. At the 1954 Detroit Auto Show, a new two-seat Ford called the Thunderbird was unveiled, with a V-8 engine, roll-up windows, and a removable hard top. Not wanting to lose any more sales to their rival, circumstances dictated that Chevrolet continue producing the Corvette. By adding a few creature comforts and a lot of horsepower, the Corvette soon became successful. And so was born the American sports car!